Two Premier League clubs are interested in signing Kelechi Iheanacho according to reports from two different English publications. The Nigeria international is under contract with Manchester City until 2021 but given his options have been limited since Pep Guardiola arrived and he has been tipped to make a move away from City in the summer. The 20-year-old has started just five times this season and with Gabriel Jesus’ arrival it doesn’t look likely that he will start many more next season. The London Evening Standard report that West Ham are interested in the striker and could pay the £20million that City want. 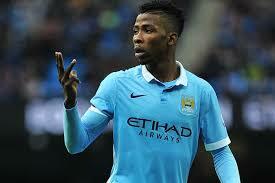 Everton are also planning a £20million bid for Iheanacho according the The Sun. Everton boss Ronald Koeman views him as replacement for Romelu Lukaku who has been linked with moves to Manchester United and Chelsea. Iheanacho Strikes Twice, Ndidi Once To See Leicester Through To FA Cup 5th Rd.